I picked up a used kingman and the log lighter portion in the firebox has rusted out. Is this a part that is easily replaced? 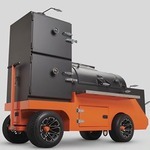 Please send us pictures of the area of concern, along with your name, shipping address, contact phone number, serial number and build date of the cooker to custmerservice@yodersmokers.com so we may properly assist you.